Do you know the SolarEdge Alliance Program? The bonus program allows solar installers to accumulate points for every kW of SolarEdge photovoltaic (PV) systems installed and registered on the SolarEdge monitoring platform. The collected points (15 points per kilowatt) can be redeemed for attractive rewards, e. g. demo power optimizers and inverters, high-quality electronics and other recreational bonuses. 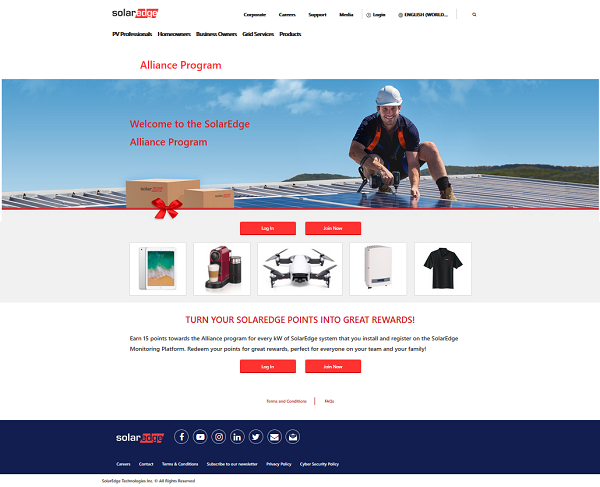 In light of the recent relaunch of Alliance platform, SolarEdge has started an autumn promotion: Each registered PV system will receive double Alliance points until 31 December 2018. Participation is worthwhile! Further information about the partner program (including the terms and conditions) as well as the registration options can be found on SolarEdge's website. The answers to the most frequently asked questions can be found in the FAQ sheet.